(CBS/AP) HARRISBURG, Ill. - Twisters roared through the nation's heartland in the early morning darkness Wednesday, flattening entire blocks of homes in small-town Illinois and Kansas and killing at least 10 people. 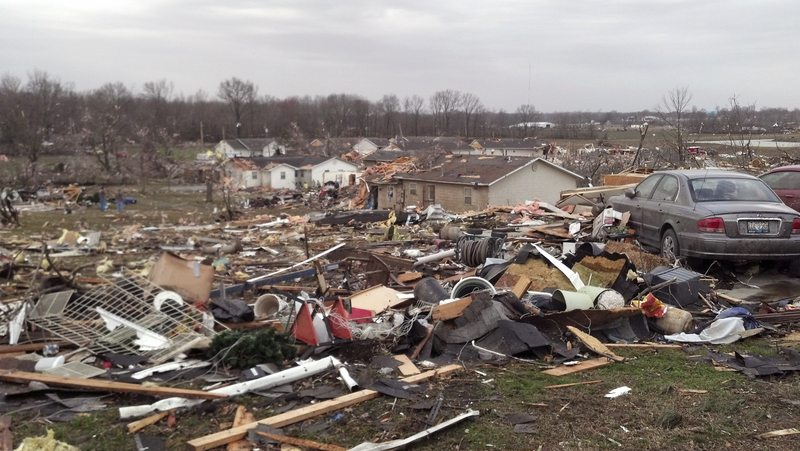 The tornado that blasted Harrisburg in southern Illinois, killing six, was an EF4, the second-highest rating given to twisters based on damage. Scientists said it was 200 yards wide with winds up to 170 mph. By midday, townspeople in the community of 9,000 were sorting through piles of debris and remembering their dead while the winds still howled around them. Not long after the storm, Darrell Osman raced to his mother's home, arriving just in time to speak to her before she was taken to a hospital with a head injury, a severe cut to her neck and a broken arm and leg. "She was conscious. I wouldn't say she was coherent. There were more mumbles than anything," he said. "She knew we were there." Mary Osman died a short time later. Arnold Wyrick of CBS affiliate KFVS reports said he saw several flipped 18-wheelers, countless downed power lines and debris in trees. "There are no distinguishable signs of where roads used to be," he said. The twister that raked Branson seemed to hopscotch up the city's main roadway, moving from side to side. As sirens blared, Derrick Washington stepped out of his motel room just long enough to see a greenish-purple sky. Then he heard the twister roar. "Every time the tornado hit a building, you could see it exploding," he said. At least 37 people were reported hurt, but most suffered only cuts and bruises. After the start of Branson's peak season in mid-March, up to 60,000 visitors would have been in hotels on any given day. Just six guests were staying at J.R.'s Motor Inn, and all of them escaped injury by taking refuge in bathtubs. Engineers deemed the building a total loss after the second floor, the roof and all windows were destroyed. Manager Lori McGauley choked back tears thinking about what might have been. "We had 25 people booked for next week," McGauley said. "If this happened a week later, we would have lost some people." At the 530-room downtown Hilton, intense winds sucked furniture away. Hotel workers were able to get all guests to safety. Looking at the city's main strip, it was difficult to believe there weren't more serious injuries. A small mall was nearly completely demolished. The Legends Theater, the Andy Williams Moon River Theater and the Branson Variety Theater all sustained significant damage. The Veterans Memorial Museum was in shambles, and a small military jet that sat in front of the museum was blown apart. Some of the most popular theaters were barely damaged. The popular Presley's Country Jubilee was virtually unscathed, as was Yakov Smirnoff's theater. A manager at the Baldknobbers Jamboree Show expected to cancel just three or four shows before performances resume next week. Other venues weren't so lucky. Branson Variety Theater's 1,600-seat auditorium was intact, but the lobby and gift shop were nearly destroyed. It could be almost two months before the theater's popular Twelve Irish Tenors and Shake, Rattle & Roll shows perform again. Back in Harrisburg, Nell Cox woke up during the tornado and glanced out her window with a flashlight to see her neighbor being blown out a window. "She crawled back to the front of my house," Cox said. She ventured outside to grab the woman, brought her indoors and summoned an ambulance. The winds were strong enough to blow the walls off some rooms at the Harrisburg Medical Center. The staff had enough warning to move the most endangered patients. Then they heard the walls collapse, officials said. The hospital discharged patients who could go home or moved them to other medical facilities. But they also had to confront an influx of injured. "Helicopters have been coming in and out here all morning," said Vince Ashley, the hospital's CEO. In the shattered neighborhoods, debris was strewn everywhere  washing machines and dyers tossed in neighbors' yards, along with kitchen sinks and sticks of lumber with nails protruding. Chunks of pink insolation added color to the disarray. Osman and his sister sorted through the wreckage at the site of their mother's duplex, looking for photos and financial records. They found 10 old picture slides that were among a collection of hundreds. Some were caked in mud and damaged by water. "My mother was a Christian," Osman said. "I know she's in a better place. That is the only thing getting me through this." In Missouri, one person was killed in a trailer park in the town of Buffalo, about 35 miles north of Springfield. Two more fatalities were reported in the Cassville and Puxico areas. A 10th person was reported killed in Cumberland County, Tenn. The tornado that barreled through the tiny eastern Kansas town of Harveyville was an EF-2, with wind speeds of 120 to 130 mph, state officials said. It left much of the community in rubble. The twisters were spawned by a powerful storm system that blew down from the Rockies on Tuesday and was headed toward the East Coast. Corey Mead, lead forecaster at the Storm Prediction Center in Norman, Okla., said a broad cold front was slamming into warm, humid air over much of the eastern half of the nation. Long a tourist destination for visitors attracted to the Ozark Mountains, Branson rose to prominence in the 1990s because of its theaters, which drew country music stars including Merle Haggard and Crystal Gayle, as well as other musical celebrities such as Chubby Checker and Andy Williams. Branson is about 110 miles southeast of Joplin, which was devastated by a monstrous twister last May that killed 161 people. Memories of that disaster motivated people to take cover after the sirens sounded early Wednesday. "I think so many people from Branson went over to help in Joplin, and having seen that, it was fresh on our minds," said Mayor Raeanne Presley, whose family owns Presleys' Theater. "We all reached for our loved ones a little sooner and got to the basement a little faster." The violent weather also lashed parts of Arkansas, Oklahoma and Kentucky, where three buildings belonging to an Elizabethtown trucking company were heavily damaged. "It picked the whole building up," said Jim Owen, son of the owner of Harry Owen Trucking. "It would take a group of 20 men five days with equipment to tear that down." The Midwest and South were to get a reprieve from the menacing weather Thursday, ahead of another strong system expected Friday. Ryan Jewell, a meteorologist with the Storm Prediction Center in Norman, Okla., said the next system is forecast to take a path similar to Wednesday's and has the potential to inflict even more damage. On Friday, he said, both the Midwest and South would be "right in the bull's eye."